device for agitating air or gases or moving them from one location to another. Mechanical fans with revolving blades are used for ventilation, in manufacturing, in winnowing grain, to remove dust, cuttings, or other waste, or to provide draft for a fire. They are also used to move air for cooling purposes, as in automotive engines and air-conditioning systems, and are driven by belts or by direct motor. The axial-flow fan (e.g., an electric table fan) has blades that force air to move parallel to the shaft about which the blades rotate. The centrifugal fan has a moving component, called an impeller, that consists of a central shaft about which a set of blades form a spiral pattern. When the impeller rotates, air that enters the fan near the shaft is moved away perpendicularly from the shaft and out of an opening in the scroll-shaped fan casing. As a light, flat instrument manipulated by hand to cool the body or ward off insects, the fan is of tropical origin and probably stems from the primitive use of palm or other leaves. The long-handled, disk-shaped fan carried by attendants was from ancient times associated with regal and religious ceremonies. In China an early form of the hand fan was a row of feathers mounted in the end of a handle; in Greece linen was often stretched over a leaf-shaped frame; and in Rome wooden fans, gilded and painted, were used. In Europe during the Middle Ages the fan virtually disappeared until the 13th and 14th cent., when fans from the Middle East were brought back by Crusaders and became fashionable for the wealthy. After 1500 the fan became generally popular; flag fans, disk-shaped fans, and tuft fans of ostrich plumes or peacock feathers, with handles of carved ivory or gold set with jewels, were common in women's wardrobes. In c.1600 the folding fan, developed in medieval Japan and introduced into Europe by way of China, became popular. The slats, of ivory, bone, mica, mother-of-pearl, or tortoiseshell, were delicately carved and covered with paper or fabric. The fan reached a high degree of artistry, especially in France, in the 17th and 18th cent. Delicately folded fans of lace, silk, or parchment were decorated with original designs and paintings by contemporary artists. The management of the fan became a highly regarded feminine art. The function and employment of the fan reached its high point of social significance in Japan. known since antiquity in countries with hot climates (Egypt, India, China, and others). The first fans were made of palm, lotus, and other leaves. Later, wicker (widespread in Polynesia and Indonesia and among the peoples of South America, Africa, and so on), wooden, and metal fans and fans made of cloth or paper stretched over a firm frame were made in the form of leaves. Paper fans are especially characteristic of Japan and China, where fans were an important article in daily life and in religious and court ceremonies; later folding fans appeared there (made of separate parts fastened at the base with a pin and with the upper ends joined by a ribbon, fine cloth, paper, or parchment cut in the shape of an arc and allowing the fan to be opened into the shape of a half circle). This type of fan was transmitted to Europe (where rigid fans and fans made of feathers had predominated until then) and became extremely widespread in the 17th to 19th centuries in all European countries. In addition to simple fans for everyday use, ceremonial, often highly artistic, fans made of precious materials (ivory, turtle-shell, mother-of-pearl, precious metals, ostrich feathers, silk, lace, and so on) were made and ornamented with extremely fine fretwork, incrustations, enamel, precious stones, embroidery, and painting. Famous artists (for example, F. Boucher, J. A. Watteau, and N. Lancret in France) and jewelers created unique fans. The materials and the type of ornamentation used in making fans changed with changes in epochs, styles, and fashions. Troinitskii, S. N. Katalog veerov XVIII veka. Petrograd, 1923. Percival, M. I. The Fan Book. London, 1920. (mechanical), ventilator, a machine for supplying air or other gases at pressures no greater than 12-15 kilonewtons per sq m (0.12-0.15 kilograms-force per sq cm). Fans are used for the ventilation of buildings and mines, for supplying air to and removing flue gases from boiler and furnace units, for drying materials, for cooling machine parts and machinery, for creating air curtains, for the pneumatic conveyance of bulk and fibrous materials, for performing certain production processes, for cooling radiators and condensers, and for air supply. In addition to industrial fans, desk and suspended fans of various types are widely used. The centrifugal blower, or radial fan, has an impeller mounted within a spiral casing; when the impeller rotates, the gas entering through an inlet is directed into the channels between the impeller vanes where, under the influence of centrifugal force, it passes into the spiral casing for discharge through an outlet. The axial fan has an impeller mounted within a cylindrical casing; when the impeller rotates, the incoming gas is displaced axially. Axial fans are simpler and more efficient than centrifugal blowers; they are also reversible (the direction of the gas flow is changed by changing the direction of rotation of the impeller wheel), but they do not provide greater pressures. Diametric or transverse-flow fans have a centrifugal impeller with curved blades, partially enclosed in a housing. An asymmetrical rotational (curl) field is created upon rotation of the impeller wheel, causing the air to flow in a transverse direction. In addition, the flow passes through the lattice of the rotating impeller vanes twice. Transverse-flow fans are more efficient and can create greater pressures than centrifugal and axial fans. Fans used for moving flue gases are called flue-gas exhausters, those used for moving air laden with mechanical impurities are called dust-collecting fans, and those built into a roof are called roof fans. Explosion-proof and acid-resistant fans are manufactured for specialized applications. The fan is driven by a motor through a belt drive or directly by means of an elastic coupling. The impellers of small fans may be fastened to the motor shaft. Large fans also have control devices and vibration dampers. The following criteria are utilized for the classification of fans: the high-speed criterion nu, which expresses the relation between efficiency, pressure, and angular speed; and the pressure criterion Ψ, which depends on the shape and number of impeller vanes (rotor blades). Their values are incorporated in the fan designation. For example, some general purpose centrifugal fans make use of such designations as Ts4-70, TsP7-40, and P8-18. “dust-collecting,” the next figure or number is the Ψ criterion multiplied by 10, and the final number is the ny criterion. Fans (for example, axial fans for mines and subways) are connected in parallel or tandem respectively to increase output and pressure. Fan development seeks to improve aerodynamic configuration and construction design in order to provide greater efficiency and output within existing unit dimensions. Fans are selected according to the characteristics arranged for the most efficient operating conditions (see Figure 1). The lines of the constant angular speeds ω and the efficiency η for various model sizes are plotted on the graph in (p, L) coordinates (p = pressure in newtons per sq m; L = capacity in cu m per sec). 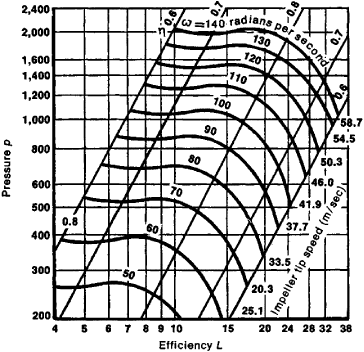 The point defining the desired angular speed and efficiency is located in accordance with L and P on the characteristic curve, after which the rating is calculated. Kalinushkin, M. P. Ventiliatornye ustanovki, 6th ed. Moscow, 1967. A mechanical device used for winnowing grain. Any structure, such as a leaf or the tail of a bird, resembling an open fan. Volume of space periodically energized by a radar beam (or beams) repeatedly traversing an established pattern. A gently sloping, fan-shaped feature usually found near the lower termination of a canyon. A device, usually consisting of a rotating paddle wheel or an airscrew, with or without a casing, for producing currents in order to circulate, exhaust, or deliver large volumes of air or gas. A vane to keep the sails of a windmill facing the direction of the wind. A fan moves gases by producing a low compression ratio, as in ventilation and pneumatic conveying of materials. The increase in density of the gas in passing through a fan is generally negligible; the pressure increase or head is usually measured in inches of water. Blowers are fans that operate where the resistance to gas flow is predominantly downstream of the fan. Exhausters are fans that operate where the flow resistance is mainly upstream of the fan. Fans are further classified as centrifugal or axial (see illustration). The housing provides an inlet and an outlet and confines the flow to the region swept out by the rotating impeller. The impeller imparts velocity to the gas, and this velocity changes to a pressure differential under the influence of the housing and ducts connected to inlet and outlet. 1. An air-moving device composed of a wheel or blade and housing or orifice plate. 2. During construction or demolition of a building, an upwardly projecting arrangement of scaffolding and netting that is intended to catch any debris that might otherwise fall to the ground. Also see axial-flow fan, centrifugal fan, plenum fan, propeller fan, return fan, supply fan, tubeaxial fan, vaneaxial fan. i. A combination of three or more cameras that provides wide lateral coverage with adequate overlap. See fan-camera photography. ii. The rotor in the beginning of a turbofan engine. iii. A propeller, especially when the emphasis is upon its function of moving air rather than propelling. iv. Any vaned rotary device for producing a current or stream of air. Specifically, a multivaned wheel or rotor used to take in air in a bypass engine or a ducted-fan engine. It can be either a mere blower or a low-pressure compressor. A device that uses motor-driven blades to circulate the air in a computer or other electronic system. Today's CPUs run extremely hot, and large computer cabinets use two and three fans to reduce temperature. See FanCard.